We're totally floored. This knock-out rug features deep sea blues in breezy palm leaves, taking us back to the tropics (fresh coconut water, anyone?). Good thing it's made to live outside, so you can soak up all the sun you want, straight from your patio. 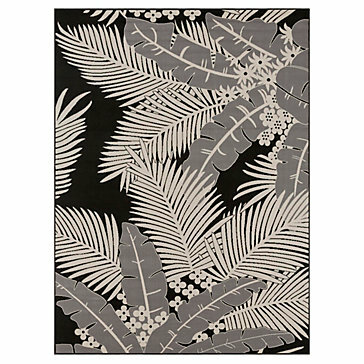 Our Hana Rug is available online only and ships directly from our vendor. This is a Special Order item, once your order is placed it cannot be canceled or returned. This item is not available for in-store pick up or in-store return. Outdoor compliant fabric is resistant to stains, abrasions, water, and sunlight, so it's made to entertain in any environment. Rinse with soap and water, if needed. This product is available online only and ships directly from our vendor. Direct Ship purchases will ship separately, directly to you via FedEx or a freight service for oversized items. If a freight service is used they will contact you to set a delivery time. If you have any questions call Internet Sales at 800.908.6748 or email us. Click here to read our Return Policy on Drop Ship items.